The largest prefecture on the island of Kyushu and surrounded by the sea on three sides and dotted with numerous smaller islands, Kagoshima offers a seemingly endless array of experiences. Visit the site where Japan launches rockets into space at Kagoshima’s JAXA Tanegashima Space Center or explore the island of one of Japan’s most famous volcanoes, the still active Sakurajima. Other options might include Miyama Tokuyan, to experience first-hand, the creation of famous Satsuma pottery. Or, you can visit the long-standing shochu (Japanese vodka) distillery, Meijigura, in operation since the Meiji Period (1868-1912), where you'll step back in time to a much simpler life. When you arrive in Kagoshima you will find yourself in a tropical paradise. 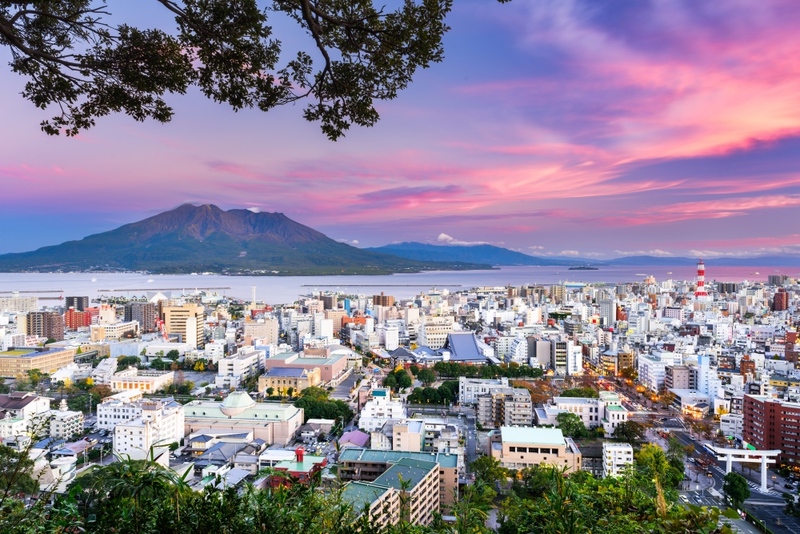 Make no mistake, the Kagoshima area is truly a treasure of gorgeous natural surroundings, ancient Japanese history and a multitude of cultural and culinary adventures. Spend a day in the mountains hiking in lush tropical rainforests, or visit Okonotaki (Okono Falls) and drink the amazing water after it has fallen nearly 100 meters from the cliff above. For a truly one-of-a-kind experience, make your way to the unique “hidden” Hirauchi Kaichu Onsen (Hirauchi underwater hot springs), where the mysterious naturally occurring hot spring baths only appear at low tide for about two hours at a time. You’ll also find plenty of seasonal festivals throughout the year. If you're looking for something a little more high speed, try a visit to the Tanegashima Space Center, said to be the world’s most beautiful rocket launch site. If you want to find the best in Kagoshima cuisine, always bet on black. At least when it comes to your meat anyway. More specifically the Japanese word for black, kuro, found in the beef and pork for which Kagoshima is well known, the skin color of both types animal black, hence the name. The kurobuta are Berkshire pork, introduced to the region about 400 years ago, while Kuroushi Wagyu originated in Kagoshima. Kurobuta is often served as tonkatsu (deep fried pork cutlet) or shabu-shabu (thinly sliced and served hot pot style with vegetables) and yakiniku, thin strips grilled. Kuroshio is most often enjoyed as a western style steak. Another notable taste of Kagoshima is satsumaage, perhaps its most famous, now be found nearly anywhere in Japan. Originally a way to preserve fish as far back as the Edo Period (1603-1868), satsumaage is a deep fried fish paste or cake, sometimes with other ingredients such as vegetables or pickled ginger added. If you're feeling really adventurous go for the torisashi or chicken sashimi for which Kagoshima and neighboring Miyazaki are well known. Free range chickens are grown specifically for this purpose and served with freshly ground ginger and soy sauce. There are no shortage of festivals and special events throughout the year all around Kagoshima. Here are a few you may want to make note of. Every year in the six month of the lunar year, shrines and temples all throughout the prefecture celebrate Rokugatsudo which has a long history as a traditional rite of summer. In Hioki city Seppetobe takes place each spring as residents dance in the muddy rice fields to pray for a good harvest. This festival has endured for about 400 years. In a more modern setting, the Tour de Minamisatuma is a road bicycle race along the Minamisatsuma Kaido Hakkei (eight coastal views of Minamisatsuma) occurring every September. Finally, from April to October, Yurigahama Beach is a popular, glistening white sand bar, which only appears at low tide, about 1.5 km of the coast of Okaneku Beach. In true Japanese fashion, you’ll want to take a little bit of Kagoshima home with you. If you're visiting Japanese friends elsewhere in the country and want to present something to your hosts, a sure bet is whatever fruit is in season. Loads of citrus like the very sweet Ponkan orange, and many tropical fruits like passion fruit are available. If you’re headed overseas then fresh items are likely not an option, but look for Satsuma pottery, which has been produced in the area since the 16th century, along with other traditional products like Oshima Silk Pongee or Satsuma Kiriko Cut Glass. And, if all else fails, the Japanese sake and vodka shochu made in Kagoshima is legendary. There are even several craft beer breweries. Looking for a top class resort in Kagoshima? A great choice would be Ibusaki Hakusuikan. Check the top right for multiple foreign language options for the website. A quintessential blend of modern and Japanese, right on the water, with traditional onsen (hot spring) baths and relaxing sand steam baths. A great alternative to a stay in entirely in Kagoshima might not necessarily be an actual place, but a journey unto itself. One of the ultimate luxury lodging and dining experiences, arguably anywhere in the world, Cruise Train Seven Stars luxury train circles the island of Kyushu, including a day traveling through Kagoshima. Kagoshima is the southernmost point of the main islands of Japan. Next stop is Okinawa Prefecture. So much history and a multitude of cultural destinations are within easy reach. The Kyushu Shinkansen links Kagoshima to the rest of Japan, so it's a great place to start or finish your trip. You’ll enjoy the most intriguing mix of Japanese culture, history and hospitality with some of the most beautiful tropical scenery and natural wonders to be found anywhere. Best to explore inexpensive airline options from Haneda or Narita there are many discount airlines. It is possible to take the bullet train, but this would take aproximately 8 hours.